Here at Tadpac Print we have updated our printing machinery. 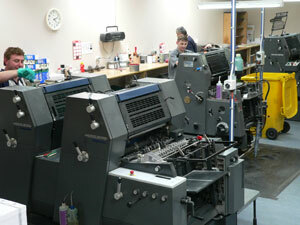 This means we can offer you even more printing options, in single and multi-colour printing. We offer all forms of printing from basic business forms through to quality four colour printing. To give your printed material that extra special look, Tadpac Print can apply any number of finishing techniques such as gold foiling, virko type (heat raising), laminating and die-cutting.
" Providing high quality printing to all our clients "
© 2011 Tadpac. All rights reserved.